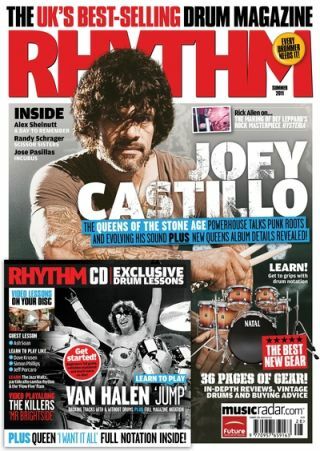 Ten years in Joey Castillo's transformation from punk powerhouse to rock god is complete. The Queens of The Stone Age drummer talks to Rhythm about his punk roots, an ever-evolving drum sound and writing the brand new Queens album in this huge 11-page cover feature. We also take a look around Joey's kit, learn all about his drum heroes and find out about the incredible musical bond he has developed with Josh Homme over the last decade. Nail a pair of rock classics - Van Halen's 'Jump' and 'I Want It All' by Queen - and indie megatune 'Mr Brightside' by The Killers. There's also our new Pop grooves series with Ash Soan, Jason Bowld's latest double kick lesson and Dave Krusen (Pearl Jam) and Simon Phillips play likes. Bag yourself a Dixon Artisan snare drum worth more than £450! You can pick a copy up from all good newsagents or order online at www.myfavouritemagazines.co.uk now. You can also find digital versions (compatible with PC, Mac, iPad and more) at Zinio.com.